I’m writing this missive from downtown Baltimore, where I’m staying for a few days for a work-related conference. It’s been warm and sunny, but the temperature inside the hotel’s ballroom is just barely above “Winter is coming Jon Snow” levels. On breaks I go outside with the smokers to warm up. I have a rental car, but I’m not sure how much I’m going to use it. Parking downtown is at a premium, and driving is typical big city aggravating. Also, the hotel where the conference is being held charges $32/day to park. So it’s looking like Uber is the way to go. The past couple of weeks have been quiet. I’ve been feeling vaguely meh, probably thanks to my delightfully wonky sinuses, so many of my evenings have been spent hermit-style, watching ORPHAN BLACK and IZOMBIE (both of which have been amazing, by the way). I did have some friends stay with me over the Labor Day weekend, which was lovely, and then also made a quick sojourn to Columbus last weekend to hit up Dirty Frank’s and 16 Bit. Okay, so maybe it hasn’t been that quiet. It just feels that way. 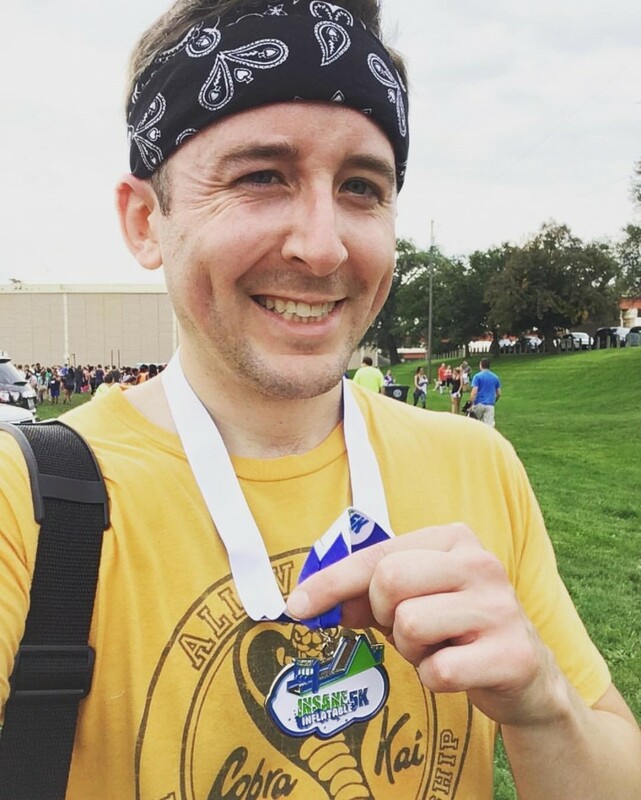 I completed my first 5K on Saturday, but it was no ordinary 5K, because those are boring and also running is terrible. This was the Insane Inflatable 5K: a course of huge, inflated obstacles spread over five kilometers, give or take. Technically it should have been called the Insane Inflatable Almost-but-Not-Quite-5K. But it was challenging as hell. Look, here I am afterwards, sweaty and tired, before being rejuvenated by a shower and a stack of buckwheat pancakes. I woke up feeling pretty good yesterday, but as the day wore on, the aches and sore muscles made themselves known. If I do this 5K thing again next year, I guess I should condition a little more (or any at all, if I’m being honest). Today is at least a little bit better. I started writing this yesterday during a layover in Detroit, which is becoming one of my more favorite airports. Free wifi and a decent selection of food options. Plus, it’s quirky, in a good way. Passing through the lengthy corridor that connects terminals A to B is like walking inside the Aurora Borealis. The walls pulse and shift with a panoply of color. A kind of trance music reverberating throughout. More airports should adopt psychedelic design elements. It would make layovers more entertaining.